Whenever the Corp scores an initiative or security agenda, force the Corp to "Trace – if unsuccessful, take 1 bad publicity." The Archivist tracks all the clans and their members, and official dealings clans have with the various corps. Half law clerk and half historian, he wields a tremendous amount of power doing a job no one else wants, but none can do without. Clearly, this should be a great include in Nexus+Power Tap decks. So...someone go do that real quick. Because no one does that yet. Got it? Cool. So now we've got an Eddie Kim Nexus deck (for his ). And now we can add Bad Publicity! So this makes all of our runs cheaper. Seems alright. Oh, and Blackmail! But if we wanted to play Blackmail, why aren't we Val? Okay okay, got it. We're Val with Rebirth into Kim with Nexus and Power Tap. And the extra BP turns on Itinerant Protesters. So let's add Investigative Journalism. Haha! Check out this mad 4-card combo that creates some HQ pressure! Yeah! Take that, Legwork. Oh yeah, that Takeshi deck used Citadel Sanctuary and John Masanori. So throw those in. And just add some money, some IHWs, and breakers. BOOM! That's a deck. I think. The Archivist is like your movie buff friend that points out idiosyncrasies in movies. You never noticed before, and you've never cared. Similarly, you've never noticed agenda subtypes and the Archivist now gleefully points out that they have them. Security and Initiative spans quite the wide selection of agendas - 46 at the time of release. From the abysmal Project Ares, to the janky Rebranding Team, to the ubiquitous GFI, the Archivist interacts with a significant portion of agendas. The actual pool of agendas that see competitive play is very small of course because of the 3/2s from the Genesis Cycle. Once they cycle out, we will hopefully see more diversity from the agenda pool. Pretty much all corp decks have at least 1 of the agendas on this list. Hell, Pālanā can pull exclusively from this list. 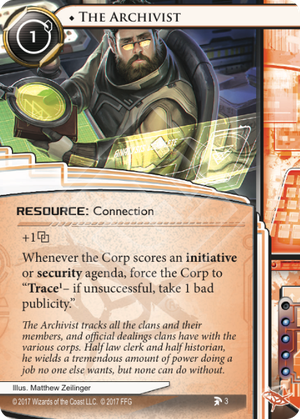 So, when including the archivist, you should expect him to fire about once a game. He fires once, maybe twice. It's a slot that nets you 2 from a Power Tap trigger and a BP. That's probably about as good as a single Daily Casts. So yeah, that's fine for a 1x include. Putting in 2x is bad because you can't install the second one, so you're getting half as much from the card slot.